Heat grill to medium-high. Combine all spices and the oil in a medium bowl to make a paste. Rub a thin layer of the spice paste onto 1 side of each chicken breast. Grill for 3 to 4 minutes on each side or until slightly charred and just cooked through. Remove from the grill, let rest 5 minutes, and cut lengthwise into 1/2-inch thick slices. 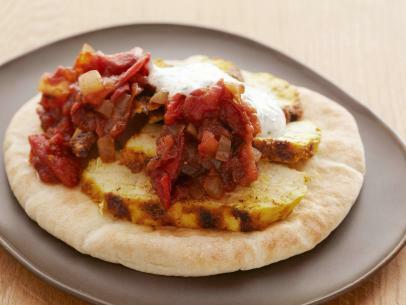 Serve openface on pitas: the chicken slices, a few dollops of Tomato Jam, and a drizzle of Herbed Yogurt. Heat grill to high. Brush tomatoes and serrano with oil and season with salt and pepper. Grill tomatoes and serrano on all sides until charred. Remove from the grill and coarsely chop. Heat oil in a medium saucepan on the grates of the grill or on the side burners. Add the onion and cook until soft. Add the tomatoes, serrano, balsamic vinegar, and saffron and cook until thickened. Season with salt and pepper. Transfer to a bowl and let cool to room temperature before serving. Place all ingredients in a food processor and process until smooth. Season with salt and pepper, to taste. Refrigerate if not using immediately.